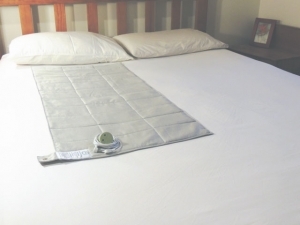 Our earthing bedding is designed as an underlay sheet so you can still use your favourite bed sheets. Our underlay sheet has 15 times more pure silver coated fibre than earthing sheets with a grey grid or criss-cross appearance and have silver fibre in 3% of their fabric compared to 50% in ours. For comparison see earthing fabric explained. Gently powerful and long-lasting – less ‘wear’ and washing due to our underlay design. 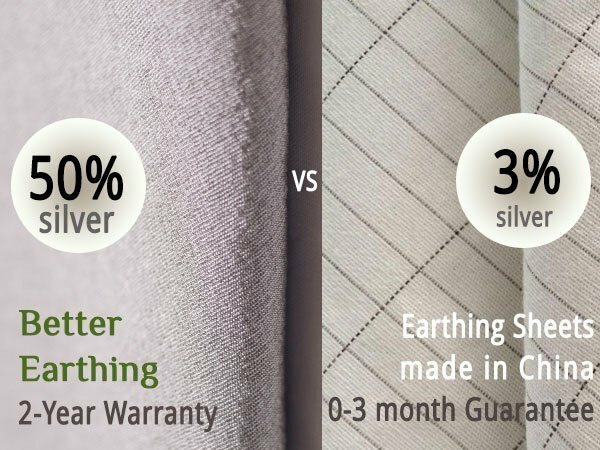 We use premium silver coated fibre from France that’s made by one of the world’s best suppliers and is treated with German anti-oxidising agent (learn about different quality earthing sheet fabric here). Silver is the most conductive metal in existence and makes for excellent earthing strength. Our earthing underlay is always hygienic due to high percentage of antibacterial and antimicrobial silver – silver kills odour, repels dust mites and reduces the need for washing. Each square metre of fabric contains 7,500 metres of silver fibre for reliable earthing conductivity. Immediate earthing through your regular sheets and pj’s – no need to wait 5 to 20minutes. 1-Year Money-Back Guarantee & our 2 Year Repair or Replace Warranty (plus find out why you need a warranty on earthing effectiveness). Read our Earthing for Better Health articles for more info. My Better Earthing sheet gave me a marked improvement in quality of sleep. More comfortable nasal breathing and no need to arise at night. Leading to more freshness and vitality during the day. Surprisingly, didn’t need my glasses at the movies. That’s the first week. Looking forward to more benefits with continued use. After 4 days of sleeping on a fitted sleep system my arthritic stiffness in my hand and hips had disappeared. It seemed too hard to believe. But now 4 weeks later, all is still good with no arthritic stiffness, and I now know the Earthing sheet did this. I’m also sleeping much better. I am sleeping so deeply on your under sheet. Thank you so much for creating this gift for people. Our Fitted Earthing Sleep System comes in King, Queen, Double and King Single sizes. 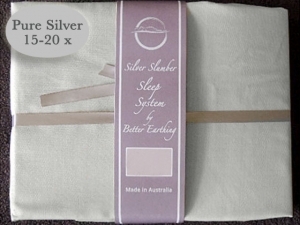 It is gently powerful and lovingly sewn in Australia from pure silver coated fibre (50% of the earthing fabric) and undyed, sustainable tencel from Eucalypt trees (50%). 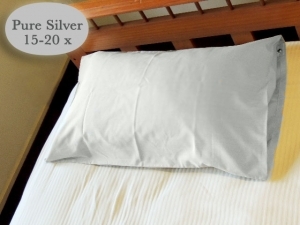 Reduce neck tension, improve circulation and more with this pure silver coated fibre inner pillow case. It is also a handy, ultra-light size for travelling. 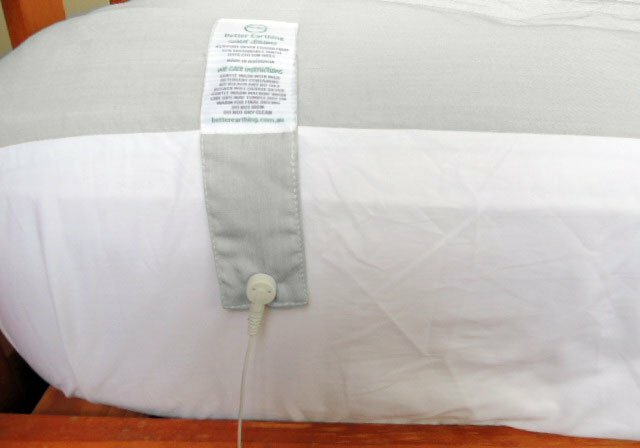 Get 8 hours Earthing overnight in whatever size bed you’re in with universal sleep system. 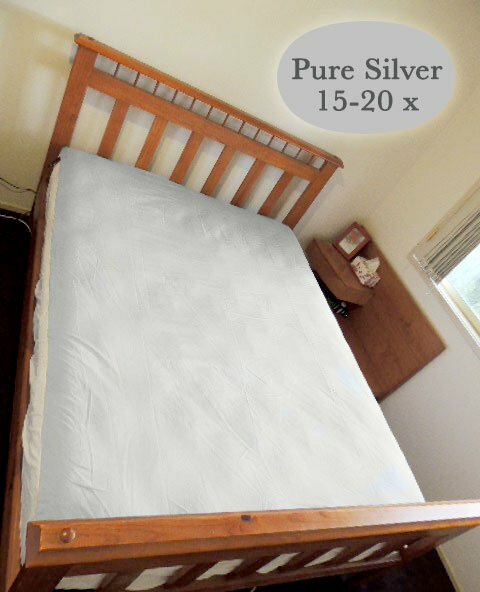 It covers half of a King, Queen, Double bed and the full length of a Single bed. 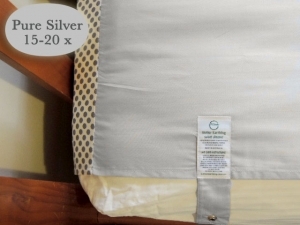 This small 1-metre long sleep pad is a great introduction to earthing overnight. It suits one person and is designed to be used like a mini mattress topper that you place under your existing fitted sheet.